More food trucks have parked on H Street daily since J Street closed. Food truck owners and operators said they have noticed an uptick in customers. More food trucks are parked on H Street this semester than usual. With District House food vendors remaining unopened, food trucks are attracting students during lunch time, prompting more trucks to park on H Street adjacent to Kogan Plaza. Even though food trucks are getting more business from students, employees said the University should still offer an on-campus dining hall. Gurnham Singh, an Indian Flavors employee, said there is a noticeable increase in the presence of food trucks on H Street this semester. And without J Street, more students are buying food from the truck, he said. Singh added that although he appreciates the increased traffic this semester, he thinks the University should still provide students with a dining hall to sit in while they eat, even if they are eating outside food. New furniture was added to the first floor of the Marvin Center over the summer to improve the space that was previously used as a dining area for students who purchased food from J Street. 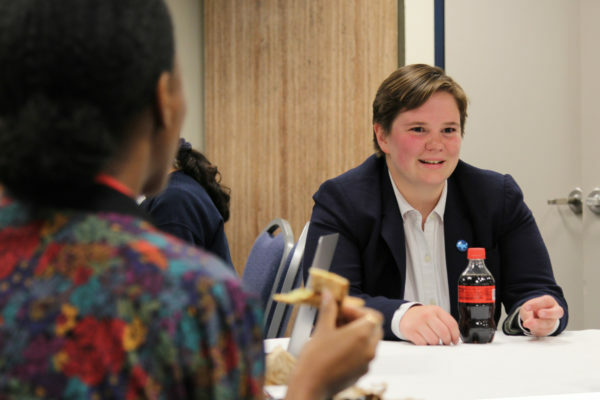 The University’s new open dining plan encourages students to spend their dining cash at off-campus food trucks and restaurants and doesn’t require students to dine at GW-run vendors. While food trucks have faced regulations on space and parking in the past, they have become a staple in the Kogan Plaza area. In 2012, some food trucks began allowing students to pay with their GWorld cards. Erfan Rouhani, a Bowtie Pastaria employee, said higher traffic at food trucks can be a plus or a minus for truck owners: There are both more potential customers and more competition with the trucks parking along H Street. 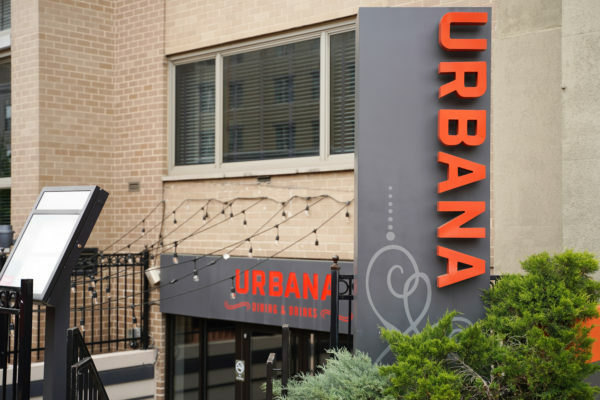 The basement of District House is set to open five new dining options for students this semester, though the date for when they will be opening remains unclear. District House is a short walk from the food truck thoroughfare. 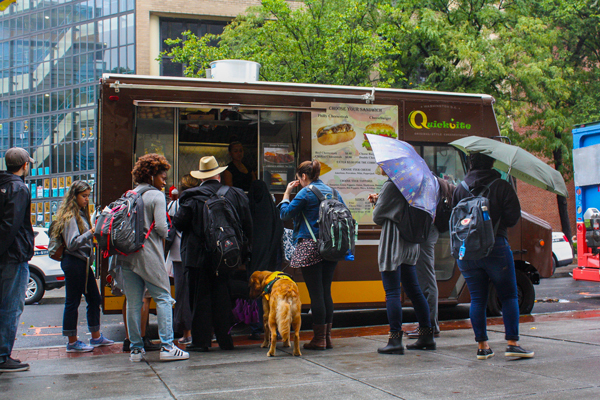 Students who relied on J Street’s kosher options can now turn to the Brooklyn Sandwich Co. truck, which opened in the spring, and students following a halal diet can eat at the Halal Fresh and Organic truck. Alex Saleh, a Halal Fresh and Organic employee, said the truck has only been coming to campus for two weeks. He added that the abundance of local options and an increase in number of food trucks give students enough options without a dining hall. “They have enough options,” Saleh said. Saleh said that his food truck moved to H Street after hearing that there was currently no main campus dining hall at GW. Student Association Sen. Logan Malik, U-at large, and chairman of the student life committee, said the increase in both the number of food trucks and student customers is at least partially due to the lack of District House vendors, but they may not a nutritious alternative. Malik added that the new open dining plan was supported by students last year and should not be written off as a failure so early into the semester. 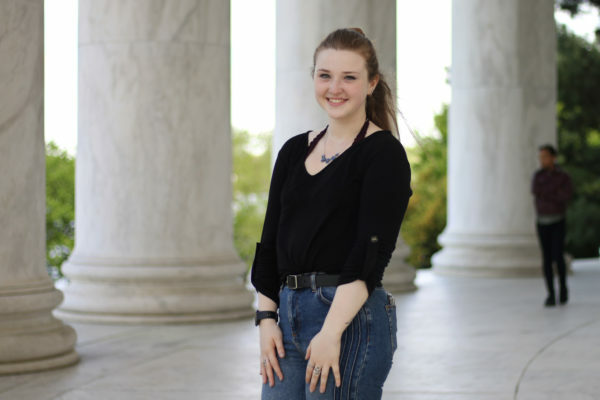 “With that being said, ensuring that students have healthy and affordable options easily available on campus should be GW’s top priority in any dining plan,” Malik said. This article appeared in the October 3, 2016 issue of the Hatchet.